I thought I'd take advantage of the 90 degree lighting capability of the BH2-UMA and explore the interference patterns from oil on water. Its very trippy. Taken with Neo Splan 5x and LED lighting in place of the halogen unit. I'm looking for the the extemely rare V-IM magnification changer for the E800 scope. If you have seen a listing or have one for sale please let me know. Thanks for the kind comments. The variation of structure is almost endless. Are this taken with epi illumination? What exactly we see in the images? 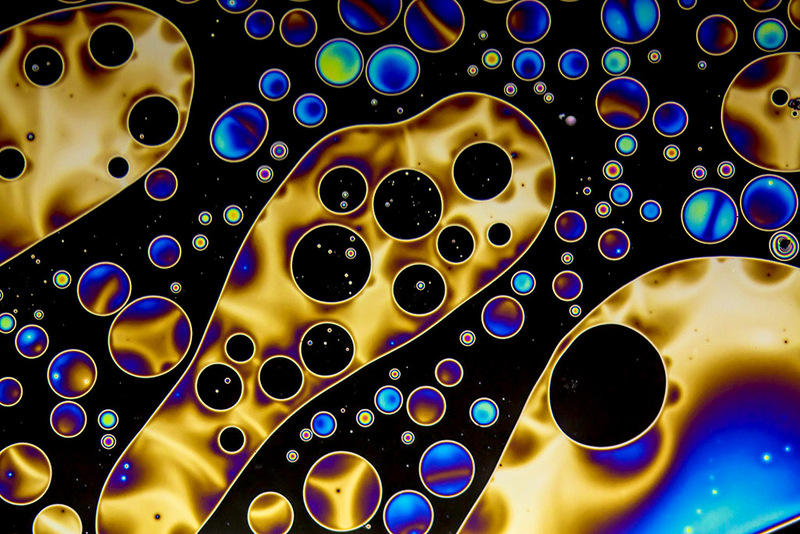 a mixture of oil and water or something else..
Beautiful and ineteresting images ! 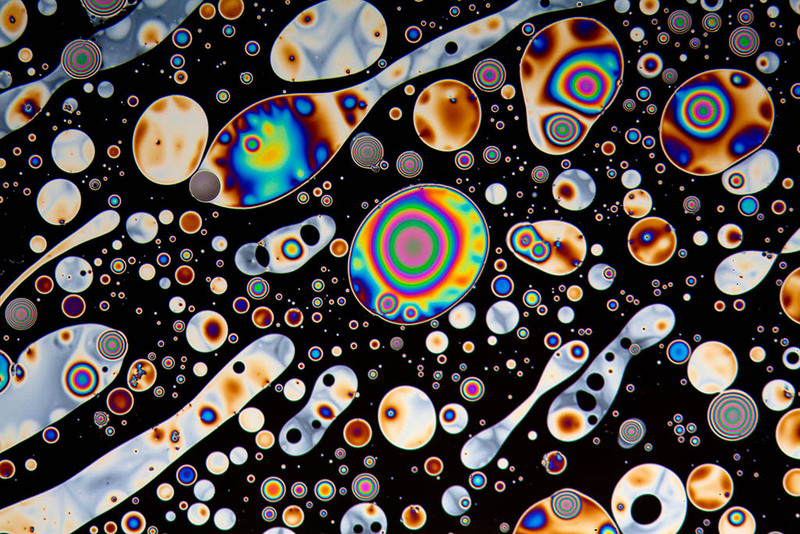 The shapes are due to a very thin layer of hydrophobic liquid residue left behind from evaporated gasoline on the surface of water. The colors are due to the interference caused by white light bouncing off the top and bottom boundary interfaces. Oil/air and oil/water. 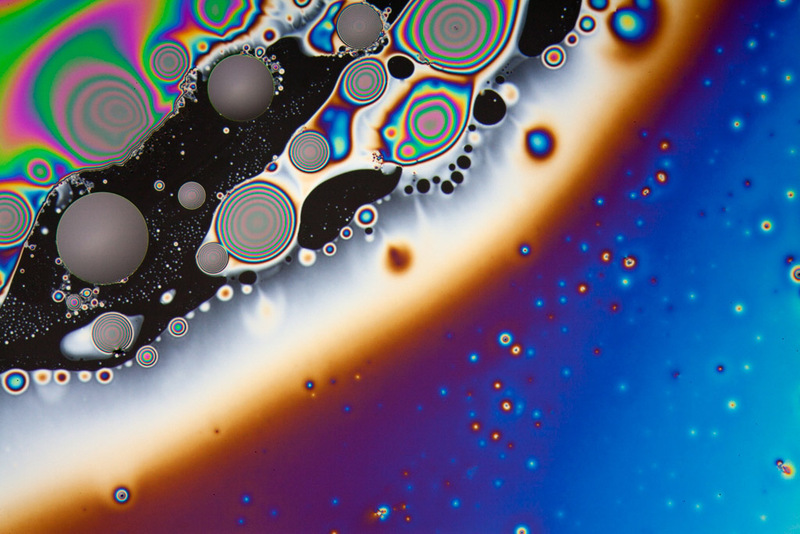 As the more volatile solvents evaporate the oil layer gets thinner and this shifts the colors seen. 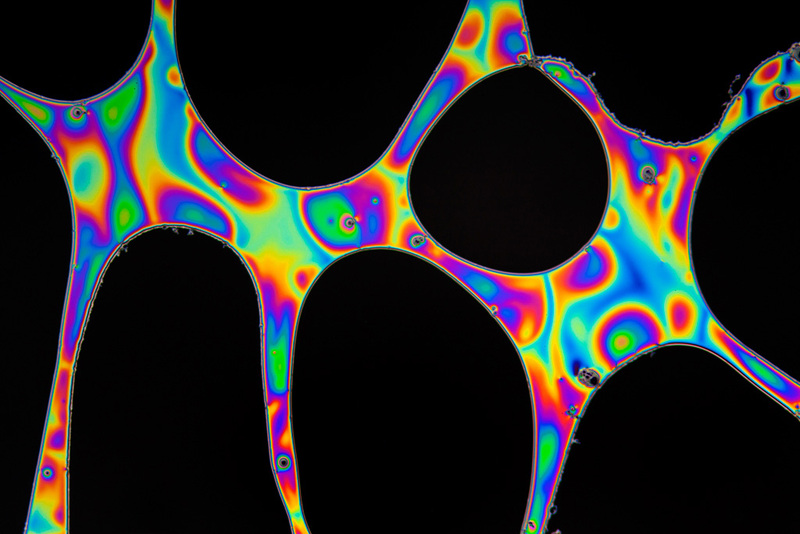 Surface tension, curved edges and particles all impact the thickness of different parts of the floating droplets which all adds to the complexity. 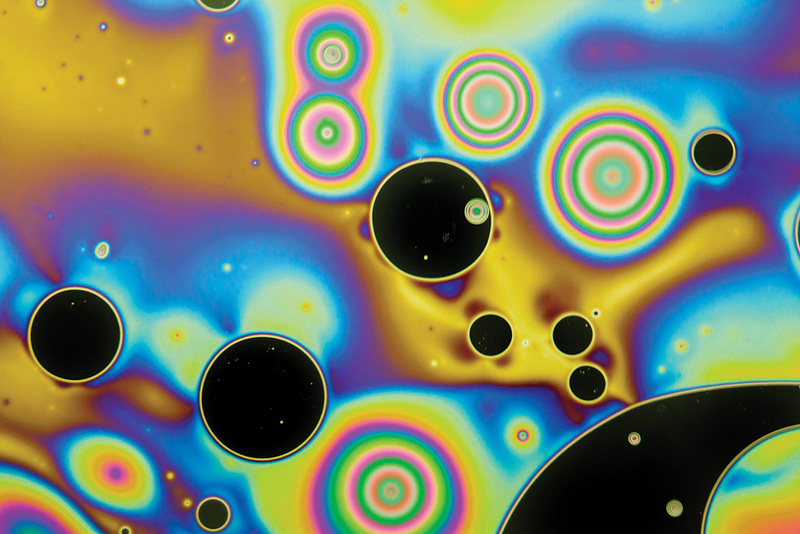 This is a similar effect as seen in soap films. The shapes are due to a very thin layer of hydrophilic liquid residue left behind from evaporated gasoline on the surface of water. The colors are due to the interference caused by white light bouncing off the top and bottom boundary interfaces. 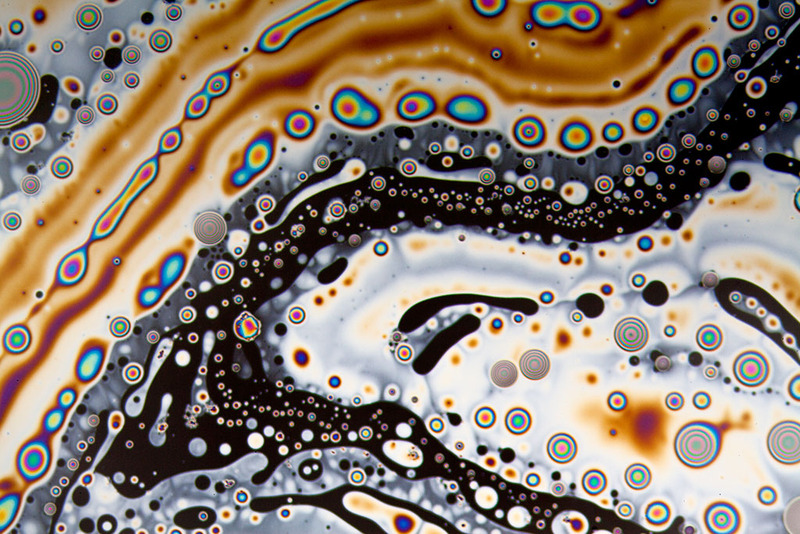 Oil/air and oil/water. 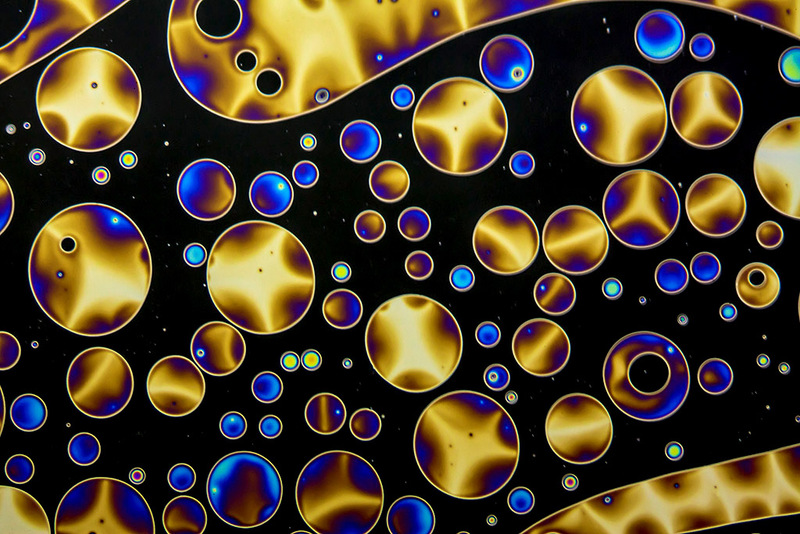 As the more volatile solvents evaporate the oil layer gets thinner and this shifts the colors seen. 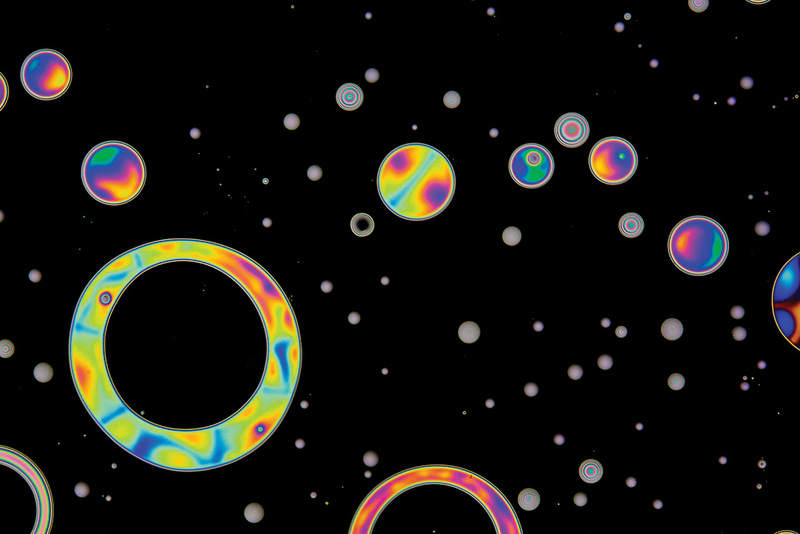 Surface tension, curved edges and particles all impact the thickness of different parts of the floating droplets which all adds to the complexity. 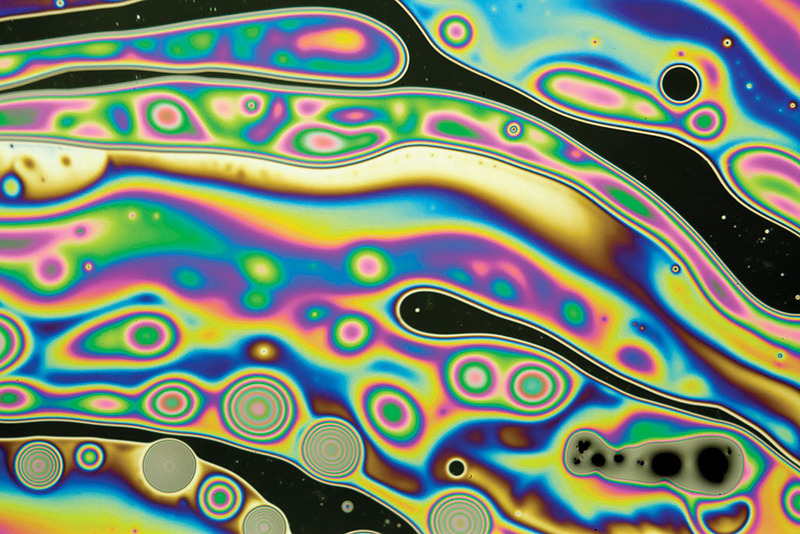 This is a similar effect as seen in soap films. Sorry for the confusion, I'm using the side lighting only when I need to balance the flat epi light but in the case of the oil it's not used. I'm using the direct epi (bright field) without the analyses polarizer.